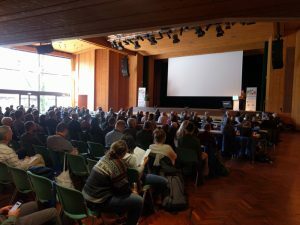 The small town of Garmisch-Partenkirchen, scenically located beneath Zugspitze, Germany’s highest mountain which has a height of almost 3000 m, hosted the DACH Meteorological Conference 2019 from 18 – 22 March. This conference takes place every three years and is jointly organised by the meteorological societies of Germany, Austria and Switzerland. This year DACH had outstanding support from the German National Weather Service (DWD), the German Aerospace Center (DLR) and the Karlsruhe Institute of Technology (KIT). The Congress Center, located in the magnificent mountain scenery, accommodated THE scientific climate-conference in the German language. About 480 participants, mainly from Germany, Austria and Switzerland, presented 200 talks and 150 posters. The attractive programme covered various scientific topics in Meteorology, Climatology and Oceanography, such as from Energy Meteorology, Environmental-, Hydro- and Biometorology, Extreme Events, Atmospheric Chemistry and Aerosols, Climate Change, Climate Variability and Social Impacts, to name but a few. An example of the range of topics within the wide field of atmospheric sciences is DWD’s new findings on the probability of occurrence of heavy rainfall events in Germany where the used comprehensive evaluation and modelling of radar data. Another study led to new perceptions on pollutant measurements and their distribution in inner cities. Accordingly, press coverage of the event in the major news was remarkable. The German Meteorological Society (DMG) presented its newly founded expert committee “Young DMG”, which addresses the needs of students and younger academics specifically , and hosted a well-attended workshop “Tools for scientific work”. During the conference eight prizes were awarded for outstanding achievements in the field of atmospheric sciences. The prizes commemorate ingenious researchers and pioneers in the field of meteorology, which is actually one of the oldest sciences. The awards continue a tradition that should encourage younger generations to engage in reliable and high-quality scientific research in the future. 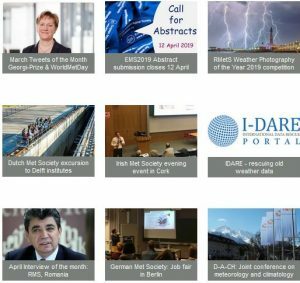 Participants of the conference had the chance to get an overview of the current state of meteorological science and were able to contact and exchange ideas with colleagues. The spectacular view of the snow-covered mountains and the blue sky from some of the conference rooms certainly inspired participants. 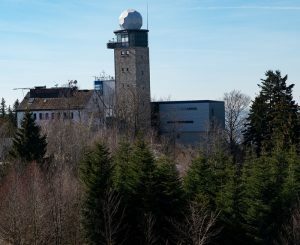 Excursions to places of scientific interest such as Hohenpeissenberg, the oldest meteorological mountain observatory in the world, were a welcome break in the very tight programme and was in high demand. Last but not least, the conference was very successful due to its many sponsors who contributed to the pleasant atmosphere, the effort of numerous volunteers, highly committed colleagues in the Organisation and Programme Committee, and the extremely warm and hospitable atmosphere in the region of Upper Bavaria. We are looking forward to the next DACH-Conference, which will be hosted by our colleagues in Leipzig in 2022.